An ultimate blend of toastiness and style. This puffer coat by Sportoli features a fashionable design, stylish stitching detail and the utmost comfortability, protection and warmth. This Quilted Puffer with Its beautiful design, elegant side braiding and ruched trim offers a hefty layer of down alternative filling topped off by a comfortable plush lining inside. 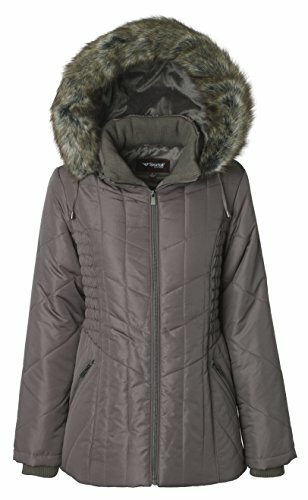 Its zip-off detachable hood features a comfy plush lining and is trimmed with fine faux fur. The nice, styled plush lined side pockets, along with the comfortable build up neck and elastic sleeve cuffs will always keep you warm. The Ruching trim and design will ensure a most feminine look. Check out the product images for more product details and detailed size chart for your best fit. Available in regular and plus sizes in a variety of colors to best meet your taste. Our coats are easy to wash: just throw them into the washer with cold water, delicate cycle; zip-off the hood before putting the coat in dryer. Dry low. Hang the hood to dry. Check the care instructions on the label inside the coat for more details.